Latchbolt is withdrawn by single oval profile cylinder from outside and lever handle inside. Door is automatically deadlocked when closed. Latch can be held in withdrawn position by operating a snib in the forend, with special key supplied . Can also be operated by key from either side using double cylinder. Standard cylinder length is suitable for doors up to 48mm thick. For doors in excess of this thickness, order correct cylinder length accordingly. Latchbolt is easily reversed without opening the lockcase. Hi, guys. My name is Darrel and I'm head of the tech team here at LocksOnline.co.uk. Thanks for taking some time to tune in and have a look at one of product review videos. Today we're talking about mortice night latches. 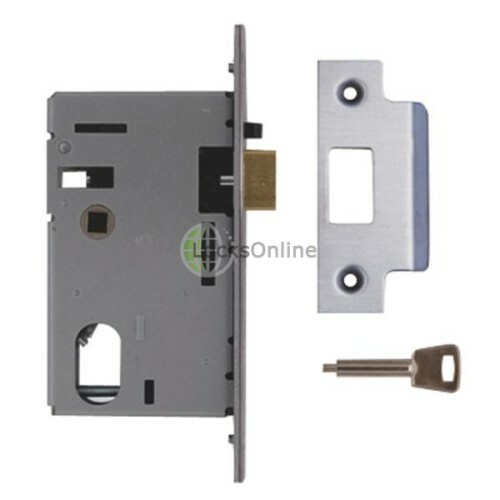 Now the easiest way to try and explain what a mortice night latch is, if you can imagine in the UK, we've got things like Yale locks and Yale night latches on our doors. On our wooden doors, not so probably on the UPC doors that are prevalent these days. But on the wooden doors, you'd probably got a Yale type lock. And when you actually close the door, the typical Yale lock would actually close and lock and you would need to get the key in which to get in. That's what we call in the industry a night latch operation and so forth. So of course, Yale locks, they sit on the door as opposed to in the door, and what I have here today is the union, it's the L2341 mortice night latch. So it's designed to do exactly the same as what a Yale does but it's more distinct to the door. So here's the actual lock itself and there's the actual latch, as you can see there. All right. That's the actual latch there. The idea is when you close the door, obviously that latch is straight in there like that. This little black knob here at the top is actually a deadlocking device, and what happens is when the actual lock sits into the frame, that thing gets pushed in and it deadlocks that. So it can't be fished with like you might see in the movies with a credit card or something like that. We call it in the industry slipping mica. But that's what that's for. Now underneath, you may see there there's is also a little Allen key, and it actually comes with a little Allen key, as you can see here. 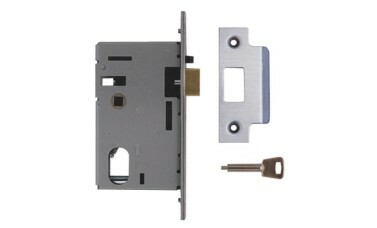 And what that does is it allows you to hold that latch in should you want to have the door to become free access. It's very similar to the snip you see on the back of a Yale. So it has all the functionality of that of a Yale type lock, saving except that it's morticed into the door. Now this one here is designed to take the older oval profile cylinders as opposed to Euro. You can buy this also in a Euro version, and we have those on our site as well, but this is the oval style here. So you can, if you want to, operate this latch by the key or you can have a thumb turn on the bottom of the euro cylinders so one side can be key and the other side can be a thumb turn. Or, you can actually have a key on the outside and then perhaps have a lever handle on the inside. So you can use this follower here that will allow you then to operate it from the inside. It can be treated like a bit of an escape lock perhaps. You could consider putting these on hotel bedroom doors etcetera. When they close the door then you'd need a key to get in, but from the inside for a quick means of escape, you can just press the handle and out you go and the door would lock behind you. So it has lots of functions in respect to that. Now it only comes in one case depth, and it's a three-inch case depth, as you can see there. So what I'll do now is I'll go through the different measurements for you. So if you're thinking of either replacing or you thinking of wanting to pop this in as a new project then at least it'll give you a bit more information. So the case depth, as I see there, is 79, 78mm. Okay. The case height is 129mm there, like that. The fore end length is 180mm and the fore end is 25mm. The actual backset, now that's the distance from the centre of the spindle or centre of the key way to the actual front of the door or to the front of the lock, I'm going to guess that's just there about . . . we're looking there about 56, 57mm, okay? It comes standard with a keep, as you can see there, and it's available in a satin chrome finish, which is the finish that you see here. There's a bit of a protective cover on it at the moment; that's why it looks slightly dull. So it has multiple uses, it can be used in loads of different types of applications and it works effectively the same. It's going to be a lot more secure, in my mind's eye, than a rim application not purely simply because it's morticed into the door. So hopefully there's enough information there to help you make an informed decision as to whether or not this is the product that you're looking for or whether or not it'll suit the application that you've got. But if you need a bit more information or you want a bit more of advice, by all means pick up the phone, use the live chat on our website. That's totally free. You can talk to me or any of the people. We'd love to see you as a customer. That'd be really good for us. So from me, Darrel, and all of us here at the LocksOnline team, take care and we'll catch up with you real soon. Bye-bye now.